Peace and quiet. Words that have gone together for so long that it’s hard to imagine that there might have ever been a time when they weren’t paired. There is peace when I’m the first person awake in the house, and I head out to the porch with my laptop and some coffee, the birds serenading me as my fingers tap on the keyboard. There is peace when I’m picking blueberries at my favorite farm. I find a remote bush that looks like it hasn’t been picked over too much, and the soft plunks of berries in my bucket will bring me peace. There is peace in a sleeping child, peace in a pot of soup bubbling on the stove, peace in a good book on a rainy afternoon. If you’re picturing something peaceful, you’re probably picturing something quiet. It’s easy to see how quiet brings peace. On the flip side, it can be difficult to see how being loud can also bring peace. I don’t have a quiet and gentle spirit. I have a big voice and an opinionated demeanor. And when you desire to be a peacemaker, that can be disheartening. So often when we talk about peacemakers, we mean the person who smooths things over. We mean someone who doesn’t make waves. We mean the person who will stay quiet. Sometimes this is true. Sometimes being quiet can encourage the loud voices to take it down a notch. Sometimes being a peacemaker means accepting that right now is not the time to add to the noise. Leaders tend like this kind of peacemaker. The person who doesn’t make waves is the person you can count on not to rock the boat, even if they disagree with you. They can keep you safe during seasons of uncertainty. 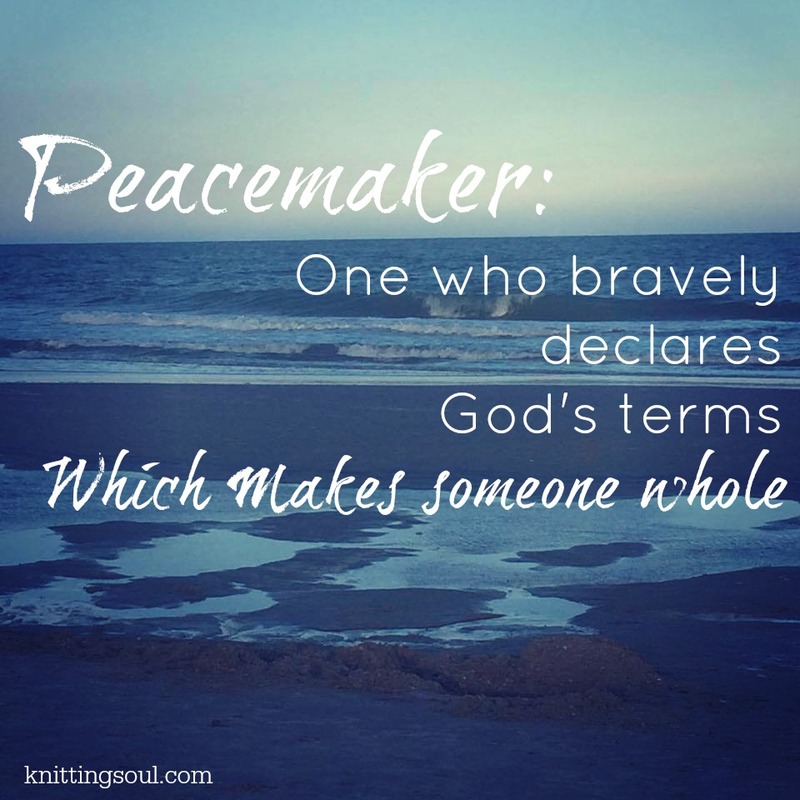 a peacemaker bravely declares God’s terms which makes someone whole. There is no silence inherent in that kind of peacemaking. There is no timidity. There is no kowtowing, no subservience, no pandering. Because peace isn’t quiet here. Peace is “when all essential parts are joined together” and sometimes getting there requires loud, bold moves. Peacemaking is when Muslim charities raise nearly $45,000 to rebuild black Christian churches that were burned when few care to mention it at all. Peacemaking is when Bree Newsome scales a flagpole to remove a flag that has been the symbol of separation between races for centuries. Peacemaking is a young man using his voice to say that he is more than the labels that people want to give him. Peace can be found in the midst of silence. But peacemaking needs brave declarations, and that requires us to make some noise. This entry was posted in OneWord365 and tagged #OneWord365, beatitudes, church, peace, Voice. Bookmark the permalink. It’s hard to see peace as something you have to enforce. That makes me remembering ideas of police states and military ruled countries. I don’t believe this leads to genuine peace. Peace most of all is made, worked for, I think. It is like a good work of art that transcends limits and unites us in having the same will. Sometimes the art in question is by its own nature dark. Because humans can go through dark times when there is no peace. Sometimes the art can be bright and light, because the peacemaker was able to see a need for brightness and lightness in people that he could address with his work. Sometimes making peace seems like an easy effort, for example to make peace in a kindergarten, when the issues are not so severe. But sometimes making peace can be very hard, as we experience it currently in the Middle East. That means we must use our chances. Speak out. Be bold. Take courage heartily. Perhaps making peace is also a lifestyle, something we must get used to do again and again. That’s not a burden, it should be a joy to do, because once we have peace, we have everything, including happiness.